Baby Led Weaning (BLW), a term coined by Gill Rapley and Tracey Murkett, is a method of introducing solids to your baby. It involves skipping the purees and offering solid finger foods while allowing the baby to feed his or herself. It is not about weaning the baby off breast milk or formula, but is about introducing the baby to solid foods. When can I start baby led weaning? Babies should not be introduced to solids until about 6 months of age. It's important to watch for these signs of readiness to begin introducing them: baby should be able to sit upright, unassisted, show an interest in food, has lost the tongue-thrust reflex and can use hands to bring food to mouth. If you start solids too early, your little one will not be able to digest it properly and it may even lead to allergies according to the American College of Allergy, Asthma and Immunology (ACAAI). Always check with your pediatrician before introducing solids. Baby led weaning saves time and energy. It doesn't require the mashing and blending that is involved with starting with pureed food. BLW allows the baby to be in control of how much and how fast they eat. This makes it more fun and enjoyable than trying to force spoonfuls of mush into baby's mouth. Allows for the baby to join in on meal times with the family. Exposes babies to a wide variety of textures, shapes, sizes and tastes, thus making them less picky eaters. Gives babies practice using the motor skills required to eat. How do I get started with baby led weaning? Offer the baby foods when the whole family is sitting down for a meal. This gives the baby an opportunity to watch and imitate others. Start by introducing one food, once a day for a couple of days. Start with a soft, easy and safe to eat food (listed below). After introducing new foods, watch closely for any sign of an allergy. As baby shows signs of wanting more food, begin introducing foods more often during the day. What are good foods to start offering? 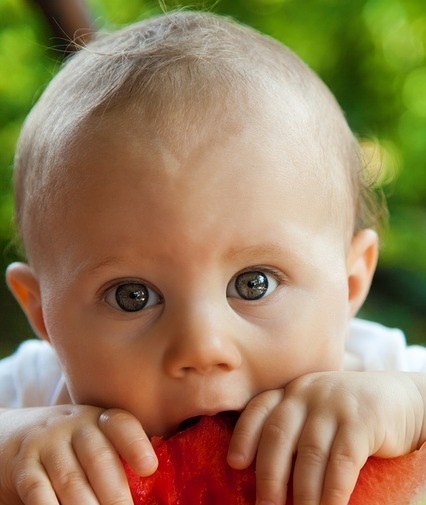 The following fruits and vegetables are just a few great options when you're first starting baby led weaning. Hard fruits and vegetables should be steamed to soften, cooled and peeled if necessary before offering. There are some common sense things not to feed baby (don't hand your little one a candy bar!) But there are a few other things you will want to avoid offering until they are older. Foods Easy to Choke on, such as grapes, nuts, cherries, etc. There is a choking hazard involved when beginning solids. It is important to differentiate from actual choking and the gag reflex, which babies will exhibit while starting solids. Before offering solids, educate yourself on safety measures for choking babies. ALWAYS supervise your baby when they are eating and don't force foods into their mouth. Don't wait until baby is super hungry before offering solids. Over hungry babies will just become frustrated and unhappy. Keep in mind that 'foods under one are just for fun." It's ok if not much food makes it into baby's mouth. It's a learning experience. BLW is a messy process. Get baby naked before offering food and be ready to give a bath afterwards for those especially messy moments. Baby may not like every food and that's ok. Wait until a later time and try offering that food again. Baby led weaning is all about going at the baby's pace.